The insurance sector is lagging behind other industries in using mobile technology to engage with consumers, according to Tristan Brandt, Aviva's digital strategy chief. Speaking at Marketing’s Mobile 2014 Conference, taking place today (30 April) at the Cavendish Conference Centre in London, Brandt explained that while it is easier for more customer-centric businesses to use mobile apps to engage customers, insurance suffers from an inherently low interest level. "Most of us don’t want a close relationship with our insurer," he said, though outlining some examples of mobile technology that are appropriate to insurers. "We built an accelerometer-based system to help people learn if they’re a good or bad driver." He also cited consumers using their cameras to take pictures to back their claims, and talked about how an increasing use of data will help insurers price products according to individuals. "Being a late entrant to mobile gives us advantages, but we are also at risk because there are certain players ahead of us," he said. "The speed of innovation has not been a strength in the insurance sector overall." Brandt was speaking during a session called 'The Right Mobile Strategy: creating insight-driven, personalised experiences that best serve your business objectives'. 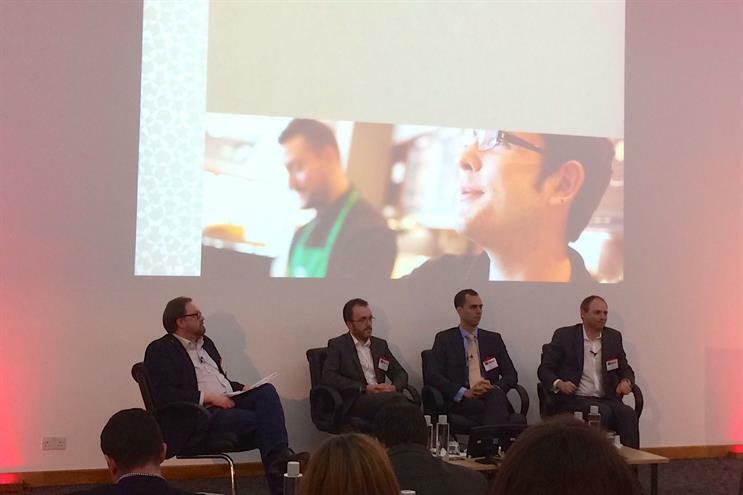 He was joined by panellists Ian Cranna, vice-president of marketing and category at Starbucks EMEA, which is set to roll out an order-ahead service to customers, and Terry Makewell, head of digital and global media at the Met Office. Cranna talked about the My Starbucks Rewards loyalty scheme and how it works effectively on customers’ mobile devices, allowing them to go into a shop, buy a coffee and accrue loyalty points using just their phones. "We’re talking about mobile strategy, but ultimately for us it’s about customer strategy and the mobile strategy has to useful [to consumers]," he stressed. "A mobile is one of the most personal items that you possess and so you’re reaching into the heart of people personal space, so it’s incredibly important to make sure you do it responsibly."